Two letters from the Research Department: one from 1984 identifies the source of the statement that 20,000 Bábís were martyred, and one from 2005 says that this source has not actually been found. First letter also includes unrelated mention about enlistment in the armed forces; see more on this topic at uhj_police_army_weapons. Both letters published (1984/1995) or submitted (2005) by and posted with permission of recipients. Background: Some historians think the number of early Babi/Bahá'í martyrs was not 20,000, as 'Abdu'l-Bahá and Shoghi Effendi mentioned numerous times, but 2,000 to 3,000 (e.g. MacEoin, "A Note on the Numbers of Babi and Bahá'í Martyrs in Iran," in Bahá'í Studies Bulletin, 2.2, Sept. 1983, and "From Babism to Bahá'ísm: Problems of Militancy, Conflation, and Quietism in the Construction of a Religion," in Religion, 13, July 1983). However, the Universal House of Justice, in a letter to an individual dated 22 January 1984, reiterated that the figure of 20,000 is "clearly recorded" in "the official government historical record of events in Iran." (Bahá'í Studies Bulletin, 3.4, Dec. 1995). 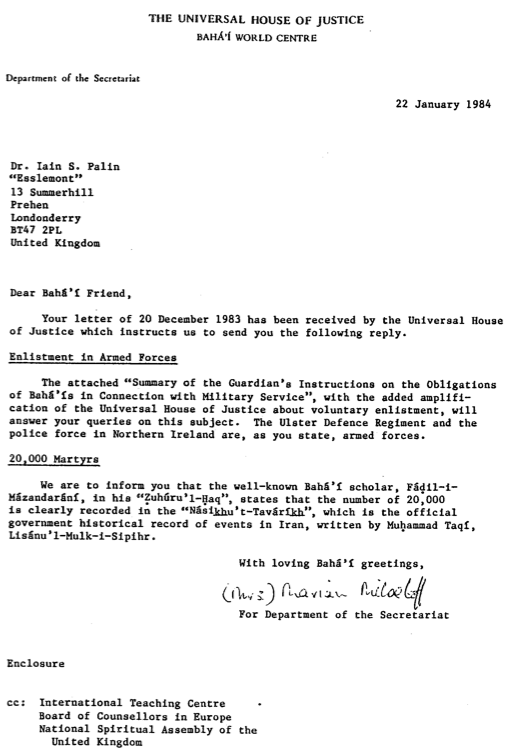 Your email letter of 21 June 2005 concerning the source of a statement about 20,000 martyrs in our letter dated 22 January 1984 to an individual believer has been received at the Bahá’í World Centre. You may be aware that, in his work "Táríkh-i-Zuhúru’l-Ḥaq", Fáḍil-i-Mázandarání has made the following statement: "the author of the Násikhu’t-Taváríkh wrote that up to the present time 20,000 individuals have been killed". While Fáḍil-i-Mázandarání makes mention of the author of Násikhu’t-Taváríkh, he does not indicate in which of his many works the reference to 20,000 can be found. In our letter dated 22 January 1984, it was assumed that the number was recorded in the Násikhu’t-Taváríkh. The Research Department has now been asked to confirm in which of the author’s works the reference is located, and it was not able to provide any further information.